Session 6, the Epic Finale! The sun has set on the lands of Qaarra. From the Stonehill Mountains to the Moaning Marsh, the once-peaceful region shudders and sighs, its back broken and its strength all but spent. It has been one year since the doom cloud swept east from the Iron Isle, spreading foulness and chaos throughout the pastoral landscape. Heroes rose to stand against this coming darkness, but they were too few. When they fell, darkness enveloped Qaarra like a sackcloth. Only in Vildeburg, once the gleaming capital city of the Qaarra, does some semblance of civilization continue. The city's stout walls offer shelter to men, elves and dwarves, and these stalwart few share stories of the horror that stalks the wilderlands. 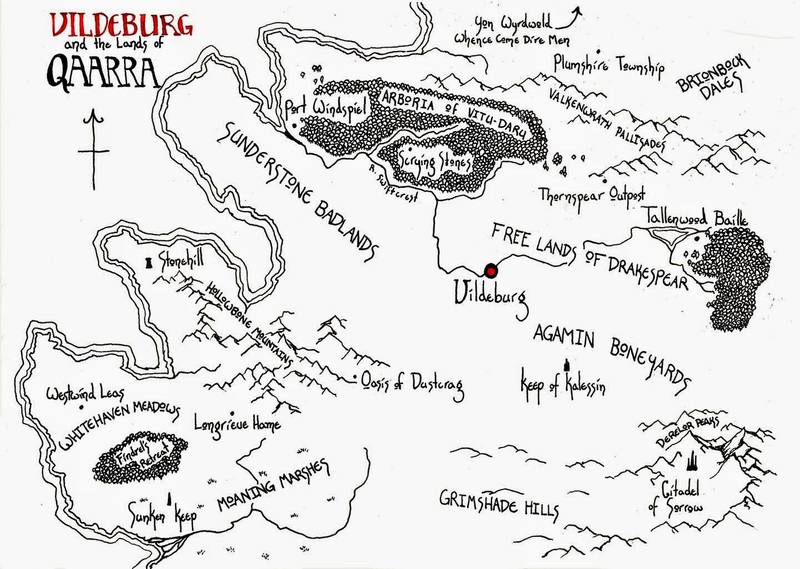 More courageous -- or foolhardy, some would say -- are the adventurers who rally in Vildeburg with plans to loot the shattered lands and carry off the mouldering wealth of Qaarra's hinterlands. Who knows what treasure lies forgotten and dormant in the ruined villages, tumbledown cairns and haunted crypts of benighted Qaarra? "The war engines are in place, the mines buried beneath the earth, and already the towers tremble; the ladders stand at the gates, the grappling hooks cleave to the walls and fire runs through the roof tops. With the gleaming swords and the menacing faces of his enemies around him, and thinking utter ruin is upon him, why should he not quake and mourn?" -- Francesco Petrarca, in Secretum, 1342 A.D.
As in years past, we'll be using Song of Blades & Heroes for most campaign games, though we hope to play some larger games using Of Gods & Mortals and Kings of War. We're capping this year's campaign at 6 sessions, but of course that won't prevent us from continuing to play games in the Qaarra milieu in the future. This page will also serve as the repository for battle reports. We typically play several games per night during our campaign, so check back for regular game reports.